Here we discuss Dry Stone Masonry, building with natural stuff in general, Eco-Art, Land Art and related topics of interest. Short answer: well it depends. 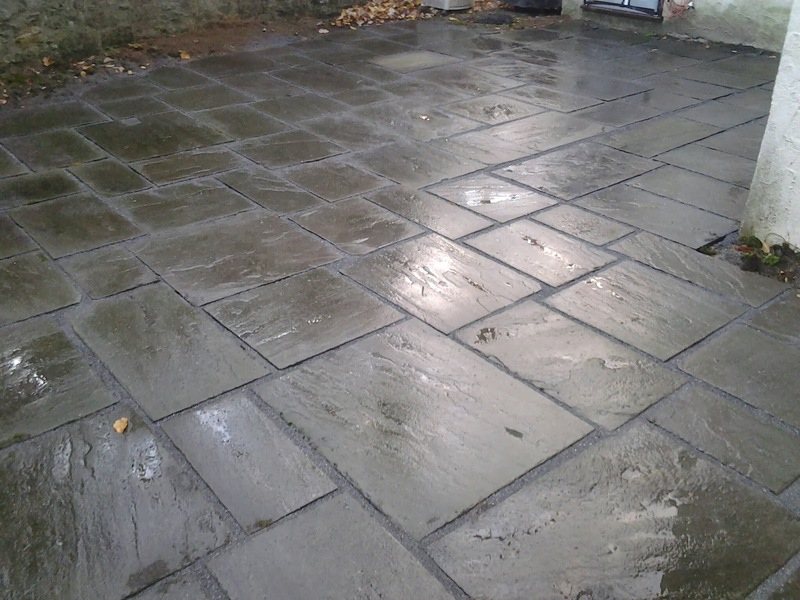 Quarry screenings (if available in your area) are generally best for under the flagstones. Screenings are also one of the best options for inbetween the stones, but there are other options available which can be utilised to achieve different aesthetic effects. First we will adress the structural issue “what to use beneath the flagstone”. Sand—ants will dig it up and get it all over the place...also the sand may wash away, causing stones to settle. Gravel—really no problems here, just use the right type of gravel. Better yet, use modified gravel for the foundation and then use quarry screenings aka grit aka quarry dust as the final leveling agent. Cement will crack. Especially grade level cement. Especially in a climate with winters like ours in Pennsylvania. Worse way to go about it would be to lay the stone upon a bed of gravel and then cement the joints between stones. Horrible idea. The gravel base is flexible and will move ever so slightly during freeze-thaw. Well, if the base was done poorly the movement might be more then slight, but let's assume the base was done well. A gravel base will definitely move a bit—looking at any of my patios, you'd never know that, but the movement does happen. Cement is rigid—if you put a rigid top on a flexible base then systemic cracking is inevitable. Cement is of course a fine joint filling material if the flagstone happens to rest upon a concrete foundation. But why on earth would you want to have a concrete foundation anyway? The concrete itself will crack, eventually. In a northern climate it will likely crack within ten years—and the chances of it cracking within the next three years are pretty high too. Environmental impact of concrete production is no small isue either. Anyway, I personally prefer dry stone work. More harmonious, warmer, just better. Sand....well, if you use a really heavy sand you should be alright. Most of the sands that are packaged for sale however are way too fine. You can use a course sand for under the flagstones, sure. Back when I used to lay brick patios I would use course sand or quarry screenings inter-changably and it was fine. Them patios still look good. Not as good as my stone patios though! Problem with using even course sand beneath flagstone is this: Bricks are of uniform thickness. Thus it's not too much trouble to just get your gravel foundation pretty close to perfect, then go ahead and screed out one quarter inch of sand for your bricks to rest upon. 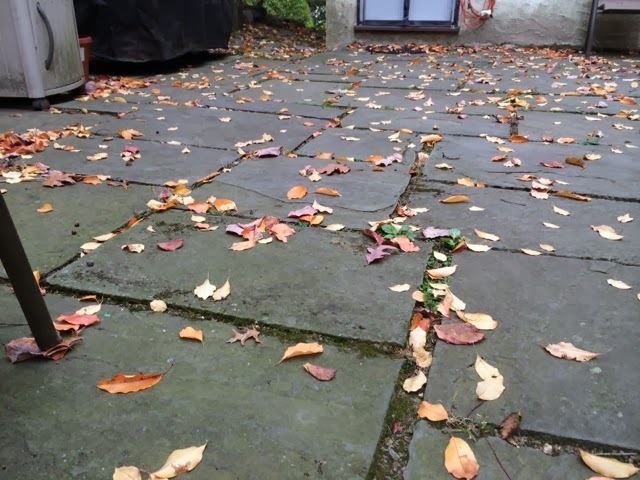 With flagstone however the thickness will vary too greatly—you may need half an inch of sand for one stone, but 2 inches for another—that'll cause problems. Screenings are almost the same thing as modified gravel—they are indeed one of the two ingredients in modified gravel...they are heavy enough that it really is no problem to use 2 inches on one stone and half an inch on another—ten years down the road, that patio will still look sharp. Another reason to use screenings is because screenings also make an excellent joint filler. 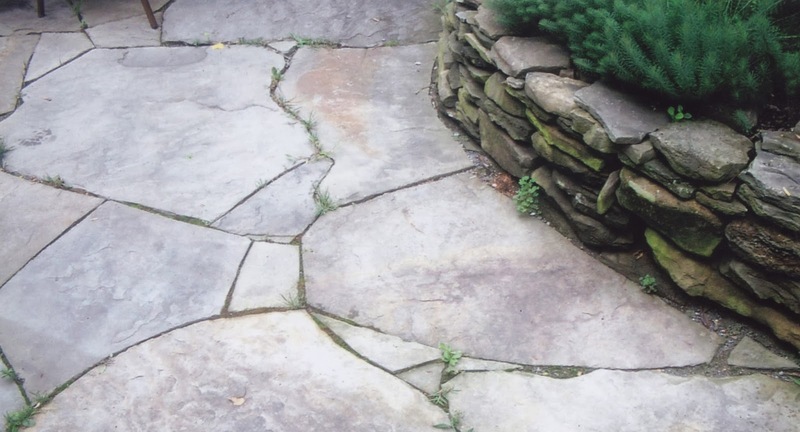 You do not want to use sand, even course sand between your flagstone joints because it can wash away—unless of course your flagstones are absurdly tight. For pattern-cut flagstone, yes, you can get away with using sand as the joint-filler. Just make sure the base is course sand, not fine. You will need to use fine sand for the joints however because of how tight they are. Again, ants love fine sand—but in this application, pattern-cut stones, tiny joints—fine sand will not be the end of the world—so long as the base is course, of course. Back to screenings—when you use screenings for both the leveler and the joint filler you are creating a good scene. If there is ever any minor issue with the screenings underneath the stone it shouldn't matter too much because the joint filler will settle down and fill the void. Having screenings up top and down below, it just works out well. You can expect to top off the screenings once within the first year—a small bit will settle or wash away. No problem, just sweep in some new material and you're good. After that, in future years, you'll be fine. My best recommendation is that clients hire me to do maybe a couple hours maintenance once a year—by no means is this nessesary, but I like my work to sparkle. I should maybe also add that using the above system I have never once had a single patio fail. Okay, maybe one stone with some minor settling—fixable in a few minutes (and rare that that ever happens) but never any major problems. Been doing this a little while too. I've seen some bad advice online about how to remove weeds from in between patio pavers and flagstones. One piece of bad advice, that comes up way too often is this: lift up the bricks/stones, lay a piece of plastic(! ), re-lay the stones. Terrible, terrible idea. Totally unnecessary and really, such a method with not help very much at all. Another piece of bad advice is this: seal the paver joints with polymeric sand. Terrible advice! Polymeric sand usually makes a mess, always cracks within a couple years, can be rather difficult to repair once it cracks up....and it's kind of hilarious how after all that trouble, weeds still grow, right through that expensive, difficult, messy polymeric sand. Ha! If laying a flagstone patio, make sure the joints are fairly tight. 1. Just pull the weeds. Old fashioned, right? Use a small hand-held torch. They make extending wands that connect to a standard propane torch, the same one you use for your camp stove. Using one of these wands will save you from having to bend down, you can use it from a standing position. Good if your back just does not want to bend too often. Use a solution of vinegar with a bit of salt added. Plant a ground cover such as creeping thyme or moss. Hire Devine Escapes to build the patio. Then hire us to do a yearly maintenance. Usually this takes only a couple hours and costs less than 200 per year. 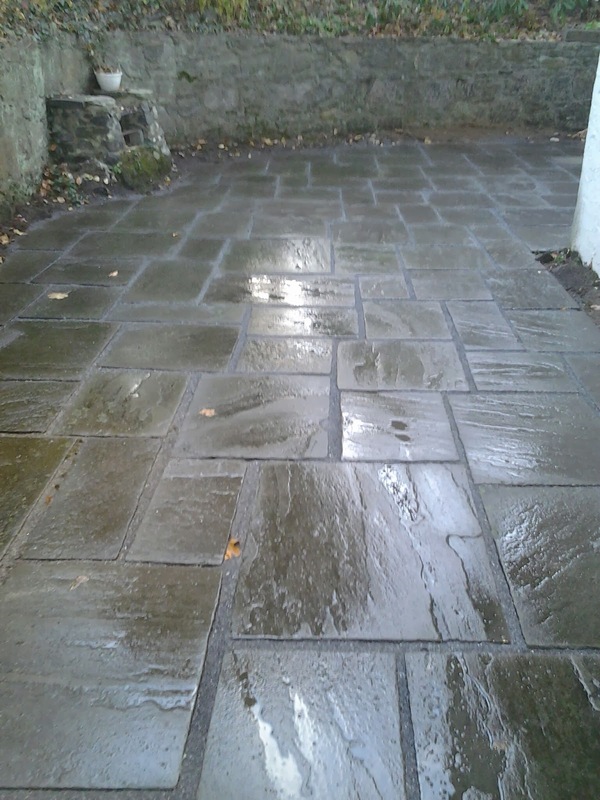 We remove any weeds, make sure there is no wobbling nor puddling, top off stone dust between the joints and like that, you're good to go. I've noticed that when clients hire us to perform this yearly maintenance in the spring, that if I stop by in mid summer, there usually is a weed or two, but nothing significant One or two weeds usually does not cause any great aesthetic offense—it can be charming, even. People stress over weeds in the patio way more than they need to. Just build your patio well, maintain it maybe once a year and live with a weed or two. The more you fret over them, the faster they grow back. Years of experience inform that last statement—the more you fret over them, the faster they grow back..
Not my work. 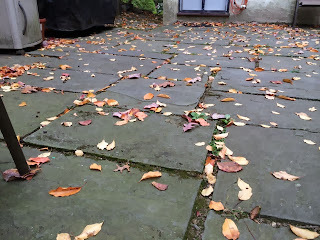 Sorry, I couldn't find a picture of one of my patios with weeds.....Anyway, hopefully this picture illustrates one of my points--one or two weeds in a patio is often no big deal at all. Sometimes, it even adds a pleasant bit of character. Standard white vinegar, the stuff you have in your kitchen, contains one percent acetic acid. Agricultural vinegar contains up to thirty percent acetic acid. You can use the stronger stuff, if you must...well, at least it's better than using some of the nastier poisons that are on the market. When using any type of acetic acid/salt water combination care must be taken to ensure that you are not poisoning nearby garden plants. In the beginning of this article I criticized the method of using plastic or landscape fabric beneath pavers. Now, I'll explain a little more. If your paver is 2” thick and sits on a one inch thick bed of sand or stone dust...what good does it do to have a weed barrier beneath the bedding sand/stone dust? Very little good at all—the weeds still have 3” of material in which to grow! And that is plenty. The really nasty weeds, with deep tubers, such as dandelions—sure, a weed barrier should at least stop the worst of the weeds from getting so deep, right? Wrong. Dandelions will surely bust right through you landscape fabric—if they've already gotten three inches down, a thin membrane is not going to stop them from getting further. No commercial herbicides have been named within this article. They might as well not even exist. 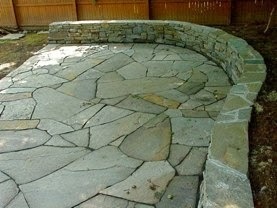 How much should a good mason/hardscaper or landscaper cost? How much should a good mason, hardscaper or landscaper cost? Well, in all humbleness I'm kinda good at what I do. Most of my jobs are sold as an entire job, with a fixed price for the entire project covering labor and materials and everything else. 50 per hour for myself. 30 per hour for any helpers. That's the basics. I charge less for certain services, more for others. Additional monies may be charged if we are working up high, hazard pay. Additional monies may also be charged if I need to bring in any heavy equipment that day. Also expect to pay for any materials needed that day and travel time as well. These hourly rates are generally applicable for masonry repair, flagstone repair, re-pointing and the like. Anything that you need fixed. New installations will usually come with a set price. Pennsylvania bluestone has been going up in price, rapidly, for the past couple years now. Also quality has been diminishing.....well, you can find good stuff, but you need to look around. Some quarries are selling only garbage lately, it would seem. Broken up, fragile nonsense—for twice what I used to pay! These are unconfirmed rumors though. It's the 'word on the street'. I go to the hardscaping and masonry supply yards and that's what the guys working there tell me. I google “Pennsylvania bluestone + frakking” and I get nothing. 2. Anyone have a good source for bluestone for me? An old quarry for sale? Ever hear of Opus 40? That guy bought an old quarry and then spent 40 years building a large dry stone land art monument out of it....yeah, I'll admit that I've had similar thoughts, once or twice....well, almost every single day. Above image from the wikipedia page on opus 40. Well, I've got a lot to say lately....been updating my other blog almost nightly. Rather than crowd that blog too much, I think I'll open up this blog again, put some of my thoughts up here. So let's talk about a recent patio repair job. Customer had a 450 square foot patio that needed re-leveling, needed weeds removed, new stone dust swept into the joints, and a general bucking up. Job took one day for myself plus two helpers. Wish I had a good photo of them on my computer--seriously, good job fellas! Anyway, we got the job done early and came in under budget--since this is repair work, I gave the client our hourly rate, material estimate and a couple of numbers, a high number and a low. We came in closer to the low. I love it when that happens. Happens often lately...I think I may be getting good at this. Anyways. 1. We set up some string lines, checking for elevations and deciding what area of the patio needed to be raised, what areas needed to be lowered and what areas just needed minor adjustments. Most of the stones were slightly off, some were dangerous trip hazards, some puddle-prone, sank-in areas existed. 2. We lifted up almost every single stone, one at a time. Re-leveling each stone individually. Re-leveling the flagstone involved digging, as needed, re-compacting the foundation with a hand tamper and adding stone dust to raise the flagstones, as needed. 3. Removed any weeds and soil that still existed in the stone joints after leveling. Used the chisel end of a rock-pick style mason's hammer for this part., used a large flat-head screw driver for the tighter joints. 3. Noting that we were coming in under budget, i decided to do a few small extras--took the time to scrape up moss that had actually grown upon the surface of some of the stones. Also, we took the soil that had been collected from beneath the higher stones and from within the stone joints, and used it to correct a nasty trip hazard that existed in the lawn right by the patio. 4. Swept stone dust into the stone joints. 5. Hosed down the joints to settle in the stone dust. 6. Top off stone dust again if needed. Leave the customer with a 5-galloin bucket half-way filled with stone dust in case the joints need topping off again. Likely, the joints will need to be topped-off once within the next year. After that, the material should be stabilized enough that more topping off shall not be nessesary. Future patio maintenance recomendations would be that the patio could use a few hours of attention from a qualified mason maybe once every 2 or 3 years--not really nessesary, but it would help the patio to sparkle a bit more. In reality the patio should be fine without any additional work, for a good decade or so.
" I was scouring the web for some advice on how to affordably even out an old, lumpy stone patio. Devin, though fairly far from my neck of the woods, was kind enough to offer up some free advice. Then, after a bit more back-and-forth, he agreed to cross the river to NY and tackle my job. He and his crew showed up right on time, and in one day had my old patio looking great. I know he's capable of much more artful work than mine, but based on how quickly, efficiently and professionally he handled my job, I'd heartily recommend him for any stone and/or landscaping work."